The maximum on any road: New engine. Greater usability and control. The new Multistrada 1260 takes you into a brand new “comfort zone”, where the pleasure of driving becomes a sense of well-being, travelling is turned into an experience and performance becomes pure emotion. Elegant and unique: The sleek surfaces, flowing design and volume difference between the front and rear remain the highly characteristic elements that in the new Multistrada 1260 reach completely new quality and finishing standards. Another highly characteristic element of the new Multistrada 1260 S are the Y-shaped 5 spoke wheels. 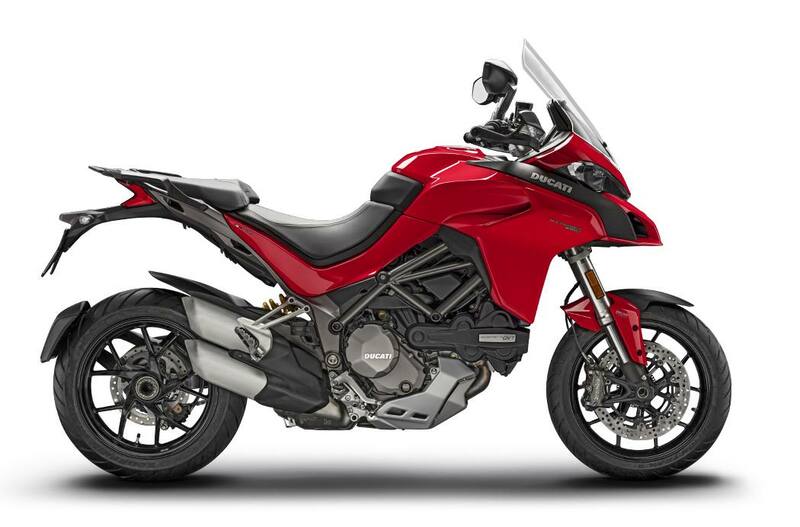 New Testastretta DVT 1262: Thanks to the new Ducati Testastretta DVT 1262 cm3 Euro 4 engine, the new Multistrada 1260 is now even more pleasurable for everyday use thanks to the increased torque at low and mid-range engine speeds. The new Multistrada 1260 is the motorcycle with the highest torque value in its category standing at 4,000 rpm, which is the average rotation rate most commonly used when driving. Even more comfort for your travels: New chassis measurements, with a longer swing arm and a new shape at the front end, make tackling curves much more effective, whilst ensuring maximum stability even at full load with side panniers and pillion rider onboard. Technological reference point: The new Multistrada 1260 also stands as a technological point of reference: maximum safety with the inertial platform (IMU) that manages both the operation of the Cornering ABS and the Cornering Light. And more: Ducati Traction Control, Ducati Wheelie Control, the highly revered Skyhook suspensions and the Vehicle Hold Control that ensures easy and safe uphill starts. The road, a free mind: The new Multistrada 1260 has long maintenance intervals: oil changes are scheduled for every 15,000 km, while the "Desmo Service" valve clearance control is required every 30,000 km, distances that allow you to enjoy all your travels, even the longest rides, without any worries. Maximies the concept of versatility: The new Multistrada 1260 truly maximises the concept of versatility: The new 1262 cm3 Ducati Testastretta DVT engine extends powers even in low gear, the new chassis and cutting-edge electronics improve control and ease of driving in any condition and on any road. Front wheel: 5-spoke Y-shape cast light alloy 3.50" x 17"
Rear Wheel: 5-spoke Y-shaped cast light alloy 6.00" x 17"